Magdalena Gryciuk is a lawyer. She has worked with a number of international organizations in the field of project management and legal aid. In her work she always has in mind the Latin aphorism Ius est ars boni et aequi, meaning the law is the art of goodness and equity. She is particularly interested in international law, civil law, real estate law and European Union law. 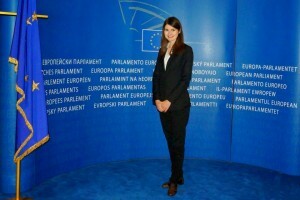 She completed an internship at the European Parliament in Brussels. In her free time Magdalena writes a blog. Together with Izabella Vajda she joined the European Foundation of Human Rights as part of the Erasmus+ programme. While she is a EFHR team member, Magdalena would like to broaden her legal knowledge, with an emphasis on European Union law, Polish and Lithuanian law. Magdalena likes being a part of an international team, especially when it comes to having the opportunity to speak in English. She hopes that during the project she will learn more languages, including the Lithuanian language. Moreover she will have the opportunity to take part in various inspiring projects and to gain experience in this field, which she hopes will have a positive impact on her career.